There are 1 cat videos tagged with nap. Kitty says " Don't touch MY computer "
All cat owners know the scenario: It’s late. 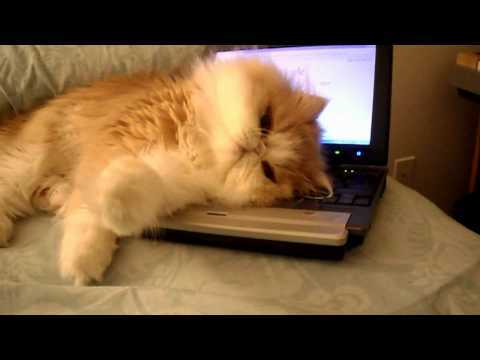 You want to sit back, relax, and watch cat videos on WatchMeow. You need your computer. Cat has your computer. You just let it all happen and accept that it is gone forever. It doesn’t take very long for Cooper to decide that a warm laptop is the perfect place for a siesta. Cooper’s owner tries to touch the computer on several occasions, only to have Cooper bat the hand away. “This is mine,” this fluffy cat says, “and you can’t have it.” He gives his owner one last glare before drifting off to dream of even more ways to torment his owner. Lesson learned: Don’t come between a cat and his cat nap choices.